It's so delicious and moist! So my plan to blog each day in January may have been a little ambitious, given that this Month is one of the busiest in the industry in which I work. I had started typing up a post when the Out of Hours phone goes off an my time is sucked up with looking at stats for a few hours. By the time I was finished I decided that I was just going to get some sleep. 4 ) During my college years I would spend most weekends at a friend house smoking, drinking and playing Super Mario Kart on the SNES. It may have been a little old at the time but there was plenty to keep a bunch of drunks happy. There was races and battle mode, then there was shaving seconds off a time trial. Things got serious when we would attempt to race on Ghost Valley 1 only using the mini-map or only using the rearview mirror, that only appears while reversing. It wasn’t unusual to have button impressions on my fingers for days after playing. 5 ) The first memorable Playstation game I played was Resident Evil, rented from Blockbusters and played on Dok’s shiny new Playstation. Excluding the acting, which is amazing by the way, the games fixed angles and music was enough to keep you on the edge of your seat nearly all the time. The first dog encounter everyone jumped out of their skin, it was amazing, the game didn’t need the all out horror just the tense moments and unfolding story. To cap it all off we didn’t have a memory card to save the games, so we play it pretty much non-stop for days on end. 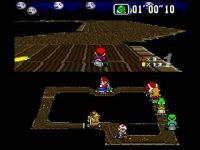 We had to return the game and then re-rented it but having completed a large chunk already could effectively speed run through most of the mansion to progress further. We got a memory care nearly at the end. 6 ) Once I had passed probation at my first job I decided to buy a PC, it was bought so I could get on the world wide web, in Fact it was on that PC I started writing the first versions of this very site. I couldn’t even tell you what the specs were but I remember the first game that was bought for it was Tom Clancy’s Rainbow Six. 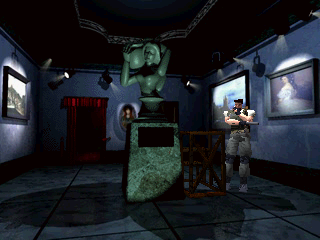 As you maybe aware the game was about an Anti-terrorist unit named Rainbow, originating from a book of the same name. 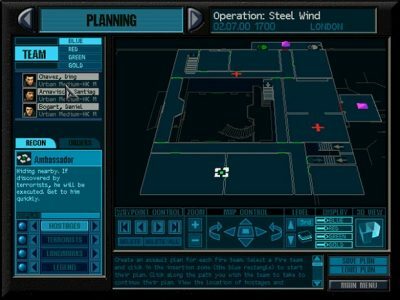 The game needed strategy, patience and timing in order to execute the tactical insertion plan, the game was unique in that you had the option of playing through the scenario controlling members of the team, or you could watch it all unfold through cameras and give orders from the safety of your living room. As the game has evolved there is usually a strong focus on story, but the planning and strategy components are long gone. I recently backed a game that was in development that had very similar qualities to the original Rainbow Six, it is called DoorKickers by Killhouse games.